As the oldest commercial winery in California, Buena Vista Winery has seen many changes since being built in 1857. In many parts of the country, caves are reserved for bats, but in Sonoma County you’re much more likely to find wine barrels in caves. Winemakers have long known that the pristine, protected conditions of these underground caverns make ideal chilly-humid climates for the wine-aging process. Wine tasters, meanwhile, have discovered the other cool factor of caves — touring, and sipping. Many local wineries open their caves to visitors, offering sit-down tastings or guided walks, and some invite you to taste straight from the wine barrels. Bats, however, aren’t invited to the party. 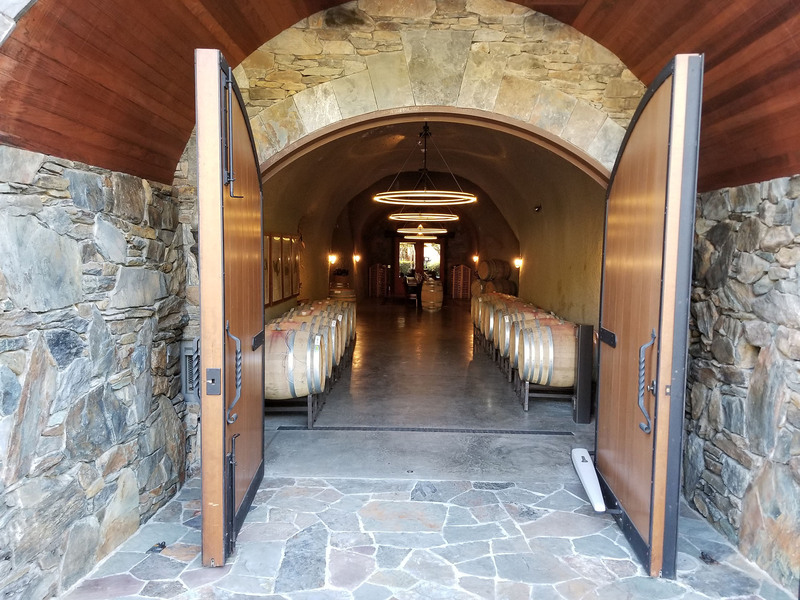 Just outside the tasting room at Alexander Valley Vineyards, a set of huge double doors lead into the wine cave, a 25,000-square-foot cavern where the winery ages and ferments its wine. The temperature inside the cave varies only 5 degrees Fahrenheit from winter to summer, between 58 degrees and 63 degrees. Completed in 2008, the massive tunnel stretches deep into the hillside to hold 10,000 barrels for the process of fermentation and aging. Free cave tours are offered daily at 11 a.m. and 2 p.m. Located in the heart of Dry Creek Valley, Bella is a small, family-owned winery with nearly 7,000 square feet of caves tucked into the steep hillside beneath the estate’s prized Lily Hill vineyard. Completed in December 2003, the caves provide 5,200 square feet of barrel storage and working space, plus 1,500 square feet of entertainment space. The tasting room (open daily 11 a.m. to 4:30 p.m.) is in the cavern, nestled at the back of the entertainment side of the cave, which allows guests to view some of the inner workings of the winery. Owners Scott and Lynn Adams are often on hand to explain the benefits of subterranean storage: a constant year-round average temperature of 61 degrees Fahrenheit and a natural humidity of 55 percent. Located in the heart of Dry Creek Valley, Bella is a small, family-owned winery with nearly 7,000 square feet of caves tucked into the steep hillside beneath the estate’s prized Lily Hill vineyard. Completed in December 2003, the caves provide 5,200 square feet of barrel storage and working space, plus 1,500 square feet of entertainment space. The tasting room (open daily 11 a.m. to 4:30 p.m.) is in the cavern, nestled at the back of the entertainment side of the cave, which allows guests to view some of the inner workings of the winery. Owners Scott and Lynn Adams are often on hand to explain the benefits of subterranean storage: a constant year-round average temperature of 61 degrees Fahrenheit and a natural humidity of 55 percent. The space also includes a dining room, a private tasting bar featuring barrel samples, and a music room for everything from live performances to cooking classes hosted by area chefs. Mark your calendar for extras like the annual candlelit, aphrodisiac dinner on Valentine’s Day. Saving energy and money were the impetus for excavating the 30,000-square-foot underground wine caves near the crush pad at Benziger Family Winery. The temperature remains at about 67 degrees Fahrenheit year round. The huge, secluded property is located next to Jack London State Historic Park, and feels like an oasis. On the Biodynamic Vineyard Tram Tour, guests board a lovely trolley for a 45-minute adventure amid the vines, including peeking in at the fermentation facility and crush pad, and exploring the barrel caves, followed by a premium tasting. Walk-ups are welcome 10 a.m. to 5 p.m. daily, but for large groups or on weekends, 24-hour advance reservations are recommended. As the oldest commercial winery in California, this gracious property has seen many changes since being built in 1857. Yet its caves speak of ancient history, and are officially considered historical landmarks. Still elegantly dark and mysterious, the caves were recently updated to add modern safety measures, creating a space where it’s a must to enjoy a tasting straight from the barrels. Paired tastings are the best way to explore, where a host will first offer the barrel wine, then the finished wine, and explain the evolution. The Barrel Tour and Tasting is available daily at 11 a.m. and 2 p.m., and lasts about one hour. Reservations are required 24 hours in advance. The expanse is impressive — more than 23,000 square feet of wine caves spanning the heart of the winery, and cut in the shape of a wine glass. Tucked behind beautiful redwood portal doors sit hundreds of barrels, leading to the grand room furnished in overstuffed couches and chairs. Such comfortable seating is a good idea, considering tasting flights can include up to 20 wines (try the standouts of super Tuscan-style “Super T Rex” red and the Old Vine Zinfandel). For quieter escapes, more intimate seating areas are scattered about, too, and your host will find you, bringing your glasses right to your table. Established in the 1980s, Gloria Ferrer was the first sparkling wine house built in the Carneros region. However, the Ferrer family has been making sparkling wines in Spain for more than 150 years. I’d be a buzzing bat in this champagne cave. A variety of tours delve into the important role that caves play in the winemaking process, from a basic educational tasting that includes the main cave overlook, to a private look at how crafting sparkling wine can take three to 10 years. A favorite option is the Bubble and Bites food and wine pairing tour, an in-depth 1-1/2 hour experience that leads throughout the different areas of the winery and cave overlooks, followed by appetizers, bubblies, and wines. Offered daily for a minimum of two people and a maximum of 14. Entering through heavy wood doors tucked into a tunnel off the tasting room courtyard, guests at Gundlach Bundschu pop in one side of its wine cave and, when they’re done, emerge on the other side, with a view overlooking the vineyards and an enormous lake. Carved into a gentle hillside, the 430-foot-long, 10,000-square-foot cave holds 1,800 barrels of wine. Throughout the year, “GunBun” hosts a variety of activities relative to the winemaking season, including a guided Farming Tour & Cave Tasting, a Harvest Tour & Cave Tasting, and a Barrel Cave Tour & Tasting. Each adventure ends with a seated wine tasting in the Barrel Cave Dining Room. Rich, dark Cabernet Sauvignon and deep, dark caves — what a lovely combination. This 100-acre estate has been in the Fahden family since 1912. It is hidden away in the Mayacamas mountain range, and produces less than 2,000 cases per year. The volcanic cave is the centerpiece, though the Monet garden beckons, too, featuring a teahouse overlooking water lily-laced ponds. Tours and tastings are offered by appointment only. Tucked into a steep hillside just behind the Kunde Family Estate winery, more than 32,000 square feet of wine caves tunnel through ancient volcanic lava flows. They burrow 175 feet below the earth, welcoming visitors with a deep perfume of aging wine and oak barrels. These caves encourage ideas for all kinds of special celebrations, such as private meals in the dining room that sits encased in 5-million-year-old volcanic rock, complete with a volcanic rock stage and elegant redwood tables. Guided tours of the aging caves are available daily at no charge and without appointment for groups of 10 or less. Coming up the winding drive, through the vineyards bordered by rose bushes towards the German chalet-style winery, it’s hard to imagine that there are caves tucked into the bucolic hillside. Yet the underground stone structures are polished and glossy and lined with gorgeous barrels. Knowledgeable guides on the private tours offer a blend of the winery’s history, insight into the Carneros region, and an overview of Schug’s “secret” winemaking techniques. Start with a walk through the vineyard, cross over the crush pad, then continue into the winery and the wine caves where, what else, a glass of wine awaits. The 8,000 square-foot underground caves at Thomas George Estates were excavated in 2010, creating an elaborate, lavish space of rough rock hung with glamorous chandeliers. Beginning at the spacious foyer set with antique wood tasting bars, the caverns stretch out like a labyrinth.The snaking hallways start with a private tasting lounge and wine library, then lead to a long communal table for sit-down dinners of up to 70 people. It’s worth a visit just for a sip of the elegant, silky Russian River Valley Pinot Noir, though white wine lovers swear by the sumptuous Chardonnay, too. For a more complete listing of Sonoma County wineries with caves, go to the Sonoma wineries listings, click on Tours & Tastings, and then click on Wine Caves. Looking for more fun things to do during your trip to Sonoma County? Take a look at the many outdoor activities to enjoy in the valleys, vineyards, coastline and Russian River areas of Sonoma County. Pick one (or more!) of the 425+ wineries in Sonoma County to go wine tasting, and enjoy farm-to-table delights at these great restaurants when you get hungry.